Find the best 2018 Halloween haunted houses in Utah at Funtober. We list all the local haunted houses, haunted trails, haunted corn mazes, and more in our directory of popular haunted attractions. Funtober brings you locations with lots of zombies, witches, vampires, monsters, clowns and creatures of the dark. These haunts have Hollywood type design sets, live scare actors, air blasters, and creepy costumes. Grab your friends for a night out of scream and chills at some haunted houses in Utah. Funtober also has the popular Facebook most liked list of America’s Best Top 100 Haunted Houses including exciting video. Utah can be translated from its origins in the Ute language as people of the mountain. Expect to find top frights in the Utah mountains. We have separate attraction links and listings for haunted houses USA, haunted corn mazes, haunted trails, haunted zombie paintball, haunted forests, haunted hayrides, and ghost tours. Opens for the season on September 14th. Asylum 49 is a haunted hospital and complete entertainment haunt. Great entertainment encompassing a 38,000 square foot facility. The scary characters include the Leprechaun, evil elves, Jason, Jack the Ripper, clowns, Michael Myers, demons, and children of the corn. It runs weekends in September and every night except Sunday and Monday in October. Doors open at 7 pm. Be aware the actors at Asylum will Touch You, scare you, chain you to a bed and do all sorts of crazy, scary things to you. Scary yes, you bet it is. General Admission is $25. Opens this season on September 21st. Castle of Chaos is the “home of hands on horror”. Salt Lake attraction is known for The Mansion, The Caverns, Nightmare in 3D, X-Scream Dungeon. Open Friday and Saturday in September and most nights in October. There are several ticket options including General Admission for either haunted house. Ticket include glow wand that will keep the monsters away from you. There are 4 levels of activities at this attraction. This is an extreme haunt: X-Scream Hands On Horror™ is an even more intense level of actor interaction. Some of our actors have been trained to give you a “special” level of Hands On treatment. Not only can the actors touch you, but they can move you as well. This can include picking you up, dragging you off, getting you wet, placing things or our pets on you, restraining you, mock torture, putting you in things, and anything else that is legal and safe. They have 5 levels of tickets that range from mild glow wand to extreme. The Fear Factory opens this season on September 7th. A paranormal hotspot this former cemetery factory has a history of twisted and unusual accidents. Workers remained dismembered, burned, beheaded and dead. The factory’s history is littered in corpses. The deadly history dates back to 1894. Fear Factory is open Friday and Saturday nights in September. Then it is open every night but Sunday in October. This haunted house opens at 7 pm nightly. Expect a full entertainment experience with live DJ’s or bands playing, concessions, and a few undead. Only street parking is available. It takes about 45 minutes to go through Fear Factory. They have a number of individual and combo ticket options. They have several extreme levels of fright depending on your ticket purchase. However everyone must sign a waiver. Ongoing for 25 years they have even more scares this year. Attraction runs Friday and Saturdays starting September 14th. Open every night but Sunday in October. It is open 7:30 pm to midnight on weekends or 10 pm on weeknights. They feature a Haunted Forest. Opens for the season on September 14th. Wander through their dark forest. Opens Friday and Saturday nights in September. Open Wednesday through Saturday nights in October. You’re stuck in 13 acres of the most menacing, horrifying and ghastly haunted forest in Utah. Hiding behind every tree and lurking around every corner are the demons, ghosts and ghouls that only existed in your worst nightmares: until now. Every step counts, because you don’t know if it will be your last. Open every Friday and Saturday night beginning October 5th, 2018. Tickets are $15. Sorry folks Nightmare Acres will is closed for 2018. The Nightmare returns on September 14th. Ranked as one of the top haunted attractions in America, Nightmare on 13th is both scary and fun. They bill themselves as the scariest haunted attraction in Salt Lake City. Tickets at $25 get you through all three haunted houses which take about an hour. Doors open at 7:30 pm. Look for Dr. Nightmare around the building. Everyone gets a free online photo taken with one of the haunted characters. Nightmare on 13th opens weekends in September. They are open most nights except Sunday in October. Expect to find frightful scares in Haunted Hollywood, Swamp Blood, and Delirium. Scary, yes very scary for both adults and children. This haunt also has a separate extreme fright experience. 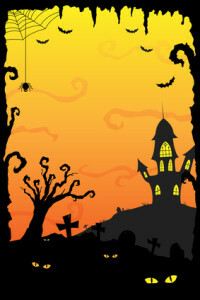 This is a Funtober Favorite 100 and a top 100 most popular haunted attraction in the country. If you can’t find the haunted house that you would like to visit in Utah, why don’t you consider searching in one of these nearby states. Have you visited one of these haunted houses? I would love to hear what you thought. Did you have a good time? Was it worth the money? Would you recommend it to others? Any suggestions to maximize your experience? I’ll gladly publish what you send me and give you an over the internet hug. New 30,000 square foot haunted house opening in salt lake city in 2018. Specialties are animatronics, special effects, and of course actor scares! That is awesome to hear! We used your site to gather more information for a post!